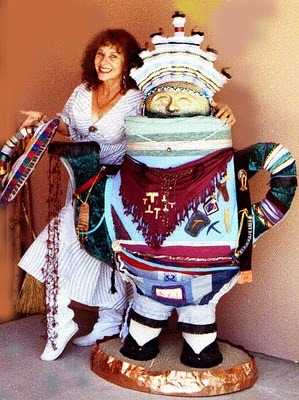 Lisa Bacon with "Upholstered Kachina Teapot"
Lisa Bacon was lip kisses and food fed to you from her fingertips. She was glorious and unabashed laughter that could be heard over a roomful of people at a party. She was flashing blue eyes that pierced your soul. She was strong, soft, gentle hands that reassuringly stroked your forearm or your back or caressed your face and stroked your hair in such a way that all worries of life would melt away. She was the voice of an angel, inspiring, uplifting, encouraging and coaxing the very best within you to surface. She was the thunder of the gods admonishing you when you forgot who you were. She was a continuous blur of movement across the room. She was the unexpected prickle of a cactus needle when she got angry, and cool slippery homemade vanilla ice cream just moments later when she got over whatever it was that had irked her. She was a bundle of contradictions that, just like the castoffs, scraps and junk that she transformed into her wildly personable sculptures, somehow all came together and made sense. She was spring air when she loved, and monsoons when she raged. She even slept with gusto, going to bed with the sun, and waking up with the sunrise. She was bubbles in the champagne of life, and she was her sculptures in motion. 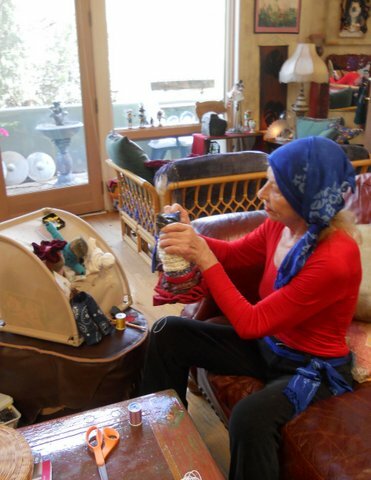 And when she passed away on the Summer Solstice, June 20, 2012, the last word on her lips (after drinking the "water, in a pretty glass" that she had requested) was, "Hooray!" Lisa at the Sedona Sculpture Walk with "The Well-Fed Woman." 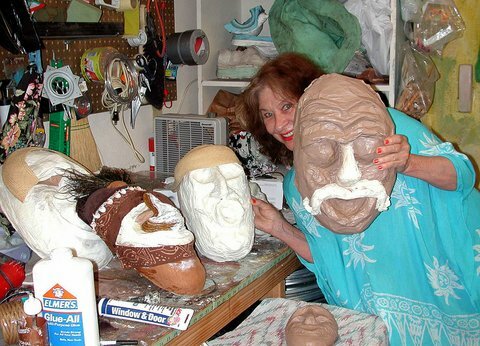 Lisa working on a variety of masks, while wearing one of her clothing designs. Lisa's used paintbrushes eventually became art themselves. We loved watching this family of characters grow. It is one of the collections that is not for sale. As the cancer advanced, Lisa never lost her joy in creating art. 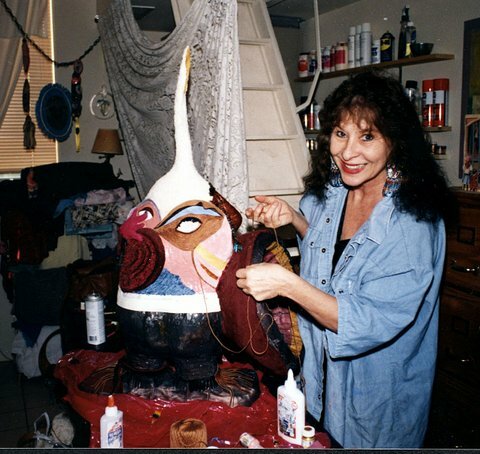 Here she is, just months before she passed, working on one of her creations. 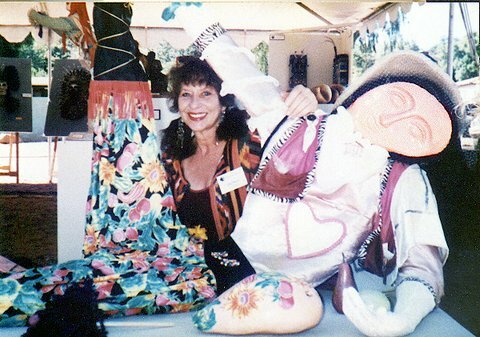 She did not stop creating until she became unconscious before her transition. 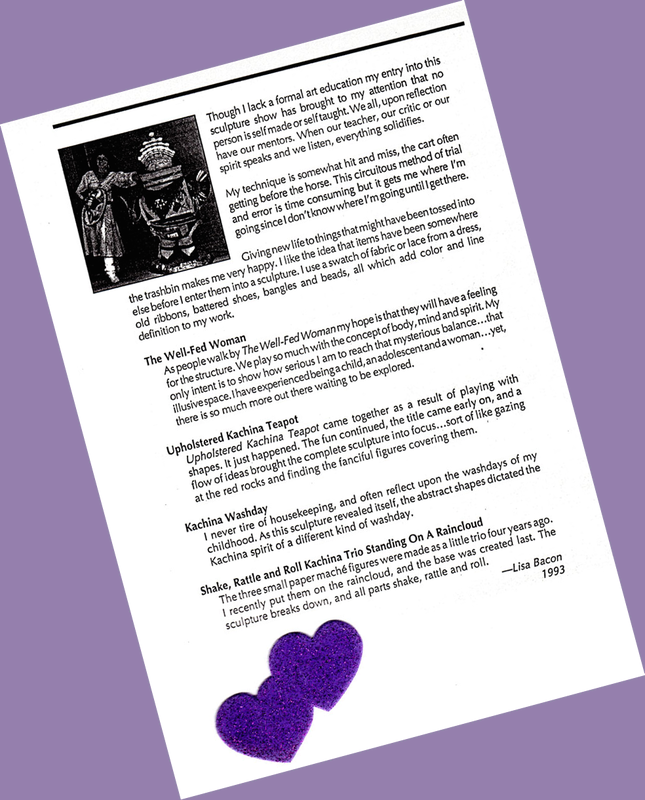 An excerpt from Lisa's Bio that she wrote for the Sedona Sculpture Walk. Though I lack a formal art education my entry into this sculpture show has brought to my attention that no person is self made or self taught. We all, upon reflection have our mentors. When our teacher, our critic or our spirit speaks and we listen, everything solidifies. My technique is somewhat hit and miss, the cart often getting before the horse. This circuitous method of trial and error is time consuming but it gets me where I'm going since I don't know where I'm going until I get there. Giving new life to things that might have been tossed into the trash bin makes me very happy. I like the idea that items have been somewhere else before I enter them into a sculpture. I use a swatch of fabric or lace from a dress, old ribbons, battered shoes, bangles and beads, all which add color and line definition to my work. “Lisa Bacon feels privileged to be an artist. She receives great satisfaction from the creative process, and makes certain that no day passes without her creating something. "She likes to respond to the flow of ideas and images that come to her. Her mixed media process gives her the flexibility that spontaneity demands. She plunges blindly and fearlessly into her work, using whatever objects are at hand to accomplish her artistic goals. "Give her a box, a plastic bottle, a bag, a scrap of wood, tape, starch, glue and caulking, and she’s ready to have fun. "Whimsical creations magically emerge from ordinary objects. These creations are covered with a dazzling array of fabrics, beads and bangles.